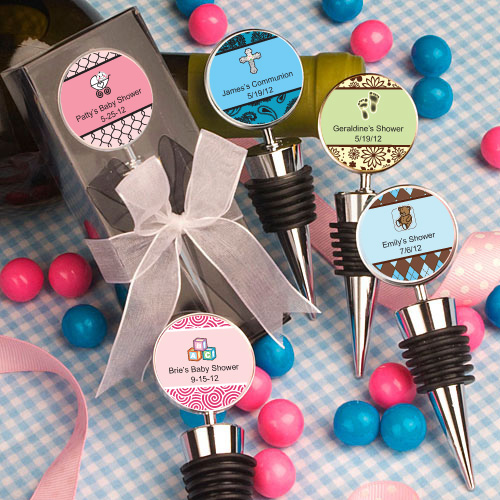 Choose useful favors for Communion celebrations for your adult guests with this custom wine bottle stopper. This 1st communion favor will encourage your guests to remember your lovely event. The bottle stoppers can be practical, or used for aesthetic appeal as a decorative trinket. Each measures 3 ? x 1? and is made of silver metal with a black-rubber-gasket-wrapped conical base and a round metal disk top with an inset center - fit for easy application of the personalized label of your choice. You design the eye catching label that suits your style! Each comes packaged in a clear topped box with a black base, finished with an attractive white organza bow, along with self sticking label sheets for you to apply.